[New for August 2016] The freezer aisle is pretty boring right now. Actually, it kind of maddeningly boring. That was a hard word to spell, but anyway. All the seasonal and limited stuff has been repeats this year and all the new stuff got dumped at the beginning of the year, so where does that leave me? Should I start hibernating during the second half of the year? Maybe I should just head to Trader Joe's since I haven't been there in awhile. 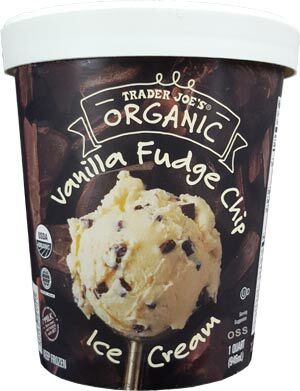 So this the newest member of the Trader Joe's freezer and their first foray into Organic ice cream (as far as I know anyway). The weird thing was that this was next to some containers of Humboldt ice cream which was supposed to be a Walmart exclusive. Doing a little investigating, I discovered that Trader Joe's ice cream is made at a plant that is owned by the same California company that produces Humboldt ice cream. Mystery solved I guess (should have grabbed a picture of the freezer while I was there). Anyway, business lesson aside, I bought this quart for $5.99 and a container of those little chocolate chip oatmeal cookies. I think I've had them before but I had forgotten how easy it is to have two or three servings of them. This realization delayed my ice cream break by a few hours. 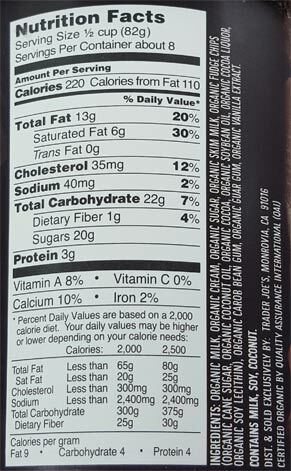 Funny, I talked about protein per serving in my last review and here we're only at 3g per 220 calorie serving. I only looked because the ice cream seems a little soft already and usually the higher end ice creams (4-5g) needs a few minutes to soften. Anyway, it's a good looking flavor with a mix of little rectangle chocolate chips and then little chocolate bits as well. The chips are soft unlike the solid all natural Turkey Hill ones. 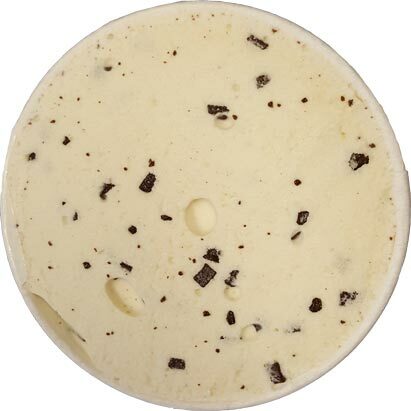 If you've ever had those somewhat soft chocolate "truffles" (blobs) you find in some ice creams, it's like those. It's different, but also a little weird. I like that it's different, but at the same time it's a little odd to chew so many little soft chips. I'm not hit with a strong vanilla flavor, it's actually quite mellow... like way too mellow. I hate to say it, but it's one of those vanillas where you kind of wonder if you are tasting vanilla or just the cardboard packaging. I know that's harsh but I'm a serving in and that's all I can think about. I didn't spend six bucks for something that taste like a hoodsie cup. Sure, it could be the chocolate messing with me, but I don't think so. The chips do use coconut oil but you can't taste coconut if you were concerned. If you want to be nosey, you could let the ice cream melt and then chew on the 6-8 chips that come with every spoonful.... ewwww, too much chewing. I got a big ol' blast of the cocoa liquor they use in the chips. That is so not my thing. I won't be doing that again. So the ice cream is fairly soft and light like I suspected (organic products arent cheap so you just have to expect a lighter texture going in at this price point). It's an easy scooper as I like to say. I'm happy enough to eat it, but it's not going to knock your socks off in anyway. It's more about feeling good (organic) than tasting good (super premium). Ha, that sounds mean doesn't it? On Second Scoop: I guess you could argue that mainstream chocolate chip ice creams aren't exactly known for blowing you out of the water with their flavorful vanilla base, but I wasn't thinking mainstream when I bought this, I was thinking about the big Organic tag and what that often implies. With the much of the marketing world cycling back toward all natural and organic and non-GMO and such, I guess we need to prepare for more mainstream organic ice creams. In other words, organic and super premium will not be synonymous anymore. I'm all for all natural ice creams though I am somewhat bothered by the airy ones that rely on gums too heavily (the same way it bothers me with regular ice cream). Anyway, it's a fine product and I will happily finish it. It's not mind blowing, but it's easy enough to put two servings of it in your belly. Try it if you want and just go from there. This is a new product - it's only about a month old. Chocolate chip isn't my favorite ice cream flavor, but I do like how fudgey these chips are. 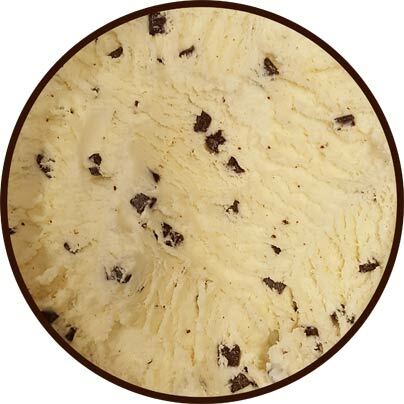 Did you ever try the TJs mint chocolate chip? I haven't but I've heard it's really dense...and the calories are even more than BJs or HD which says a lot. @Anon: uggg, sorry! the opening paragraph was going to be for the not new baskin-robbins pumpkin cheesecake flavor, but I decided to go to Trader Joe's instead. I am the worst proof reader ever! @Deb: nope. I had their peppermint joe-joe's flavor though and a few other flavors and it didnt strike me as crazy dense. it's higher than mainstream stuff but I wouldn't say it's H-D level dense. Definitely better than Friendlys. It's been a while since I've had it, so I can't recall how dense it is - but I do remember really liking the mint chip.